This is our precious Niko. 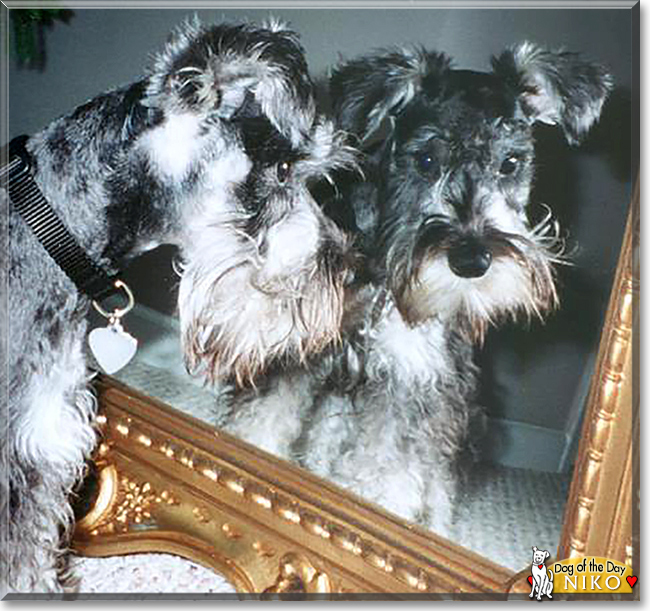 He is a fifteen year old Miniature Schnauzer from Macon, Georgia. He is pure love wrapped in that warm, fuzzy, little body. He is a joy. My husband never thought he could love a dog so much, and thanks me every day for wanting one. Niko is so smart! I often wonder how such a complex brain fits into his small head. He loves to watch "The Animal Planet," so I leave the TV on when we leave the house. This is a picture from several years ago, but it is our favorite. My grandmother visited and saw Niko for the first time. She asked, "Y'all couldn't find one no purdiern (prettier than) that?" This picture is him verifying that, indeed, he is as cute as his mama and daddy tell him he is. Talk about Niko in Pet Talk!